A Fort Lauderdale police officer was suspended after a YouTube video surfaced of him slapping a homeless man. The incident occurred Sunday afternoon when Fort Lauderdale Police Officer Victor Ramirez went to arrest Bruce Laclair, 58, possibly for loitering. 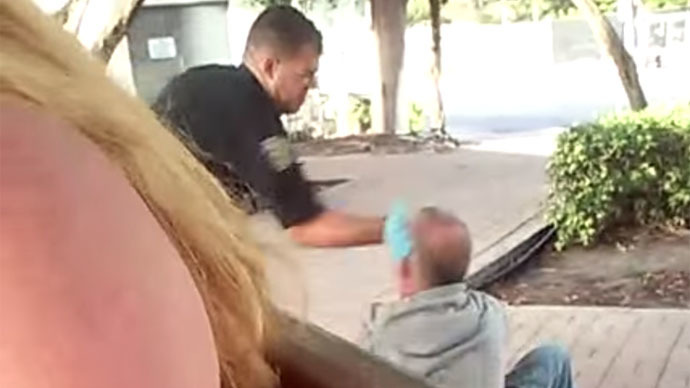 In the video, the officer is seen escorting Laclair out of a bus terminal when Laclair seems to resist. The officer then pushes him to the ground. Laclair tells Ramirez he needs to pee, but the officer tells him he cannot. The officer then tells Laclair to get up, but then says, “I’ll push you to the ground and beat you if you [expletive] want to fight me.” The two argue for a few more seconds before the officer slaps Laclair, who falls onto his side. “I’m not [expletive] around with you. Don’t [expletive] touch me,” the officer said. The officer handcuffs Laclair and proceeds to check his pockets. After radioing other personnel, Ramirez finally walks away with Laclair. Laclair was charged with trespassing. He pleaded no contest on arraignment and was released from jail on Monday, though he was ordered to pay a $300 fine. A witness to the incident told Local 10 News that it began after Ramirez told Laclair to leave the bus terminal. While there are signs posted around the terminal that warn people against loitering, it is unclear if that is exactly why Laclair was asked to leave. "There was a bunch of commotion," Gerald Schorder told Local 10 News, who said he saw the slap. "The guy didn't raise his hand to the officer at all. The officer just knocked him down with his hands. The guy was defenseless." After the video surfaced, the Fort Lauderdale Police Department launched an internal investigation. Ramirez has been suspended with pay. Advocates for the homeless are speaking out about the incident, stating that situations like this one are becoming more and more commonplace. "We've heard over the last 20 years that that kind of thing happens," Sean Cononie, founder of the advocacy group Homeless Voice, told Al Jazeera America. He said that Laclair’s alleged treatment was indicative of a city determined to rid itself of all homeless people. "They treat you like you're nothing but a piece of filth." Homeless advocates like Western Regional Advocacy Project (WRAP) are campaigning for a bill called 'Right to Rest' in several states, which would put an end to laws targeting people who sit, eat, sleep, or stand in public places. The bill has been introduced in Oregon and Colorado, and organizers are looking for a sponsor in California. A report by law students at the University of California, Berkeley discovered that the surge in laws targeting life-sustaining activities in public coincide with cuts in federal funding for affordable housing, which began in the early 1980s. “Homelessness isn’t a criminal justice issue…it’s about lack of housing not lack of cops,” Boden said.